I have always been the adventurous type. I wear my hiking boots, take my backpack, and off I go exploring; walking up the most strenuous mountain trail, breathless at the amazing views. But with age, my travel style has changed. With a career advancement, more money came my way – but also way more responsibilities, and less free time to do what I like. Thankfully, companies like Flash Pack have become the go-to operators for professionals like me in their 40s, who want to enjoy adventure travel, and at the same time appreciate some comforts. 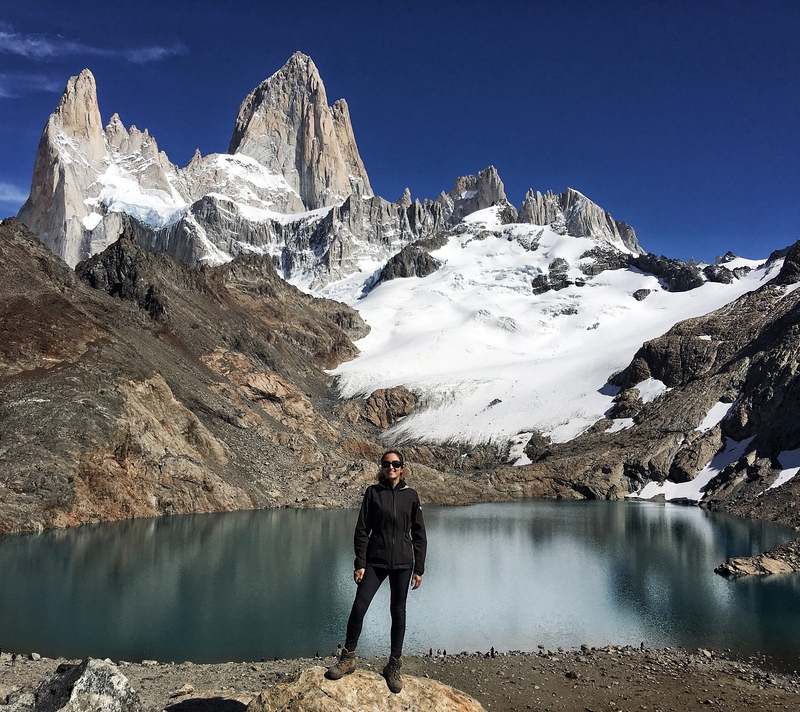 Standing on a boulder, posing for a much-deserved photo in front of Monte Fitz Roy, in Patagonia, and having finally overcome one of the biggest “not yets” in my life, I realised how happy I was for being pushed out of my comfort zone. Some places simply can’t be seen unless you literally work your way there. They are so isolated, so remote, or so protected that no cars, planes or helicopters can get there. In fact, in the case of Patagonia, not even horses are allowed on the trails. All for the best, I think! I honestly doubt I’d get the same sense of achievement if I didn’t have to puff my way up a trail, row my way along a river, or ride my way through a valley to get to see an incredible view. I guess this can all be summed up with the old saying, “it’s not the destination, it’s the journey”. One of the biggest set backs of adventure travel is how uncomfortable it can be. Endless bus rides, uncomfortable beds in very basic accommodation, and the list goes on. If roughing it up a bit when you are young is part of the charm of adventure travel, this isn’t nearly as appealing when you grow older. The good news is that in your 40s, you can still hike the steepest mountain, walk the toughest trail, and meet the local communities while enjoying a good level of comfort. During my Argentina trip with Flash Pack, I was as adventurous as it got during the day, and enjoyed the comforts of a cosy, warm room at night. I also welcomed the private bus taking us around, and some of the tastiest meals my gourmet self could have hoped for. Adventure travel requires time – before and during the trip. A lot of research and planning has to be put into it, especially if you have a limited window for your break. You really don’t want to get to a new destination and spend hours, if not days, trying to find out how to get to the place you want to explore, figuring out the local transportation system, or overcoming language barriers. And if you do all the research beforehand, you quickly realise it is a full-time job that demands a lot of time and energy – which you simply don’t have, or you wish to dedicate to other things (i.e. family and friends). If there is one thing I have learned in many years of solo travel, it’s that some things are more difficult to do alone. Hiking is one of them. For long, strenuous hikes with nobody on the trail, you could injure yourself or get lost; and it’s harder to seek help alone. Joining a Flash Pack adventure means meeting like-minded people of a similar age and life stage. Not only will you have company for your adventures, thus taking the edge off complete solo travel, but you’re likely to make new friends for life. In Argentina, I was relieved to meet some fantastic hiking enthusiasts who were just as eager as I was to explore Patagonia. Group travel doesn’t mean being spoon-fed by a guide. One of the things I appreciated the most on my escape to Argentina was the amount of independence the group had. I hardly felt attached by the hip to other group members. And I enjoyed the fact that, though most days were fully planned out, others were completely free for me to do whatever I enjoyed. My solo traveller self was thrilled to have to dig out information about optional activities on the free days. The best part of it? I had other like-minded travellers joining me on those days. Too often, we push aside our travel dreams. Whether it’s hiking a mountain, scaling a rocky wall or trying our favourite dish in the very place where it was invented – we keep finding excuses not to pack our bags and go. We tell ourselves it is not a good time. Or we feel insecure to travel alone, and can’t find anybody to join us on our adventures. 2019 is the year to live your dream, to embrace the motto of No More Not Yets. Patagonia was my biggest travel “not yet” to date, and it was only when I sat on that boulder facing Laguna de los Tres that I realised how much I had been wanting to hike there. If you still have any doubts about embracing adventure travel, rest assured that Flash Pack will be there for you. You can rely on them for an epic trip that will take you to the most incredible places, along with some other incredible travellers. I am so glad I finally decided to embrace adventure travel and live my dreams. What’s stopping you from living yours? Take Cape Town in style, with a one-day trip that sees you hiking Table Mountain before abseiling your way back down, heading off on a safari of a lifetime, and rambling through the Stellenbosch vineyards. Explore the wilds and wonders of Costa Rica, with an 11-day trip that includes kayaking alongside turtles, tubing down turquoise rivers, hiking across lava fields and trekking up volcanoes. Get your nature on with an exotic trip through Sri Lanka, as you search for elephants, sloth bears and leopards on safari, cycle through UNESCO World Heritage Sites, and release baby turtles into the Indian Ocean as the sun sets. Dreamy.